The ContiMilestone is the right tire for all motorcyclists who feel perfectly at home driving their motorcycle along a country road. The tire has an agile handling characteristics and always delivers superb mileage performance and speed stability. It provides maximum grip, even in the rain, and is thus suitable not only as a tire for cruisers but also for tourers heading off on that next big road trip. 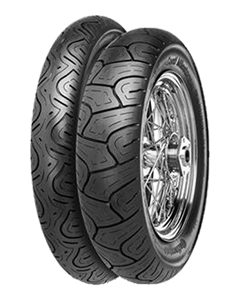 Continental now offers the ContiMilestoneMileagePlus cross-ply tires in many new sizes to fit on Harley Davidson Sportster, Dyna, Touring and CVO models and don't have to miss out on the great benefits of Conti tires. Because of its impressive long-life qualities, the ContiMilestone has turned into a real long-distance runner and has become a hot tip for tourer riders.